Beaphar Fresh Breath Spray 150ml is an easy way to keep your pet’s mouth clean and hygienic, for better oral health. Bad breath can sometimes be due to bacteria living in the mouth. This fantastic mouth spray contains both eucalyptus and antibacterial agents, to ensure that the mouth stays fresh and bacteria free. 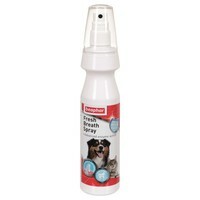 Get rid of your pet’s nasty breath and help to maintain good oral health with this easy to use Fresh Breath Spray!